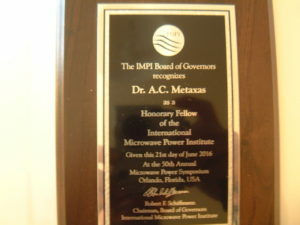 Dr Metaxas continues his research on radio frequency and microwave energy usage in industry. Specifically he has been investigating the problem of arcing in high power RF applications in industry, first by detecting fast ways of detecting the onset of the arc following by rapid ways of suppressing it. Latterly, he and his co-workers have been developing software to characterise the formation of corona in point–plane axisymmetric configurations starting from a single electron in the gap and considering the continuity equations, Poisson’s equation and Navier Stokes equations. These equations are coupled and finite element solutions have been developed and fully validated. The latest results concern 3D configurations in DC discharges between a point and a plane in gaps of the order of mm. Solutions at higher frequencies leading to radio frequencies used in industry are now being contemplated.